EK PEHAL is a journey which began on 7th January 2015 in a aanganbadi school outside Gate No. 7 of IISER Kolkata with dedicated founding volunteers - Preethi Thomas, Abhinash Kumar, Sai Madhav, Shubham Chaudhary, Rohit Bhagwat, Prithvi Raj and Jayshree Deheria. I was alloted the job of registration of children from nearby villages to our campus (mostly belonging to underprivileged families) and then teaching them mathematics on the very same day. Within one month, EK PEHAL shifted to air-conditioned classrooms in Lecture Hall Complex of the institute, thanks to the immense support of IISER Kolkata administration especially former director Prof. R. N. Mukherjee. 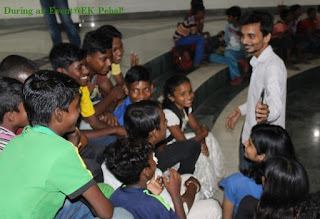 In the beginning EK PEHAL started with children of class IX -XII only, later with increasing no of IISER Kolkata student volunteers, class V-VIII students were also accommodated in this initiative. At present, children visit our campus daily during evening hours as per their schedule which vary on the basis of standard and medium(Hindi/Bengali). Our main focus is to improve the fundamental basic of Mathematics and Science of children through interactive and demonstrative sessions along with communicative English classes, extra- curricular activities to boost children's confidence. By understanding about various shortcomings in an individual child as well teaching volunteers, EK PEHAL team decided to go for aptitude test for children in mathematics at admission time to find suitable topics to be taught to them as per their actual potential and assign them appropriate teaching volunteers. I proactively chose the responsibility for this aptitude test (designing, conducting and evaluation). This test had five sections A, B, C, D and E with questions of the level of 1st to 5th Standard, 6th-7th standard, 7th-8th standard, 8th-9th standard and 10th standard of Indian schooling system, respectively. All children were given questions beginning from section A up to their assigned standard in school. After evaluation, almost all students were found to be lacking and were not up to the mark for their then assigned standard in school. We were not surprised at the results as we understood that almost all of the students studied in nearby government schools which failed to provide quality education in terms of clarifying basic concepts. Consequently, our team of volunteers were at first, assigned to teach Basic, Intermediate and Advanced level mathematics depending on at what level a particular student was unable to attempt the questions. As mentioned earlier we had already identified each student’s potential from the aptitude test to children. Currently this has become the standard practice for all children who get enrolled in EK PEHAL for mathematics class and a similar format is being followed for teaching English as well. Since then my evening hours are mostly spent with EK PEHAL children and it gives tremendous pleasure to me being with them-teaching them, answering their questions and ultimately seeing quality smiles on their faces! So far I have tried to teach basic and intermediate mathematics class and regular Physics and Mathematics classes to IX-XI standards. It gives me immense joy to see the "Quality smiles" on their faces when they understand any topic which they initially considered difficult due to low confidence. 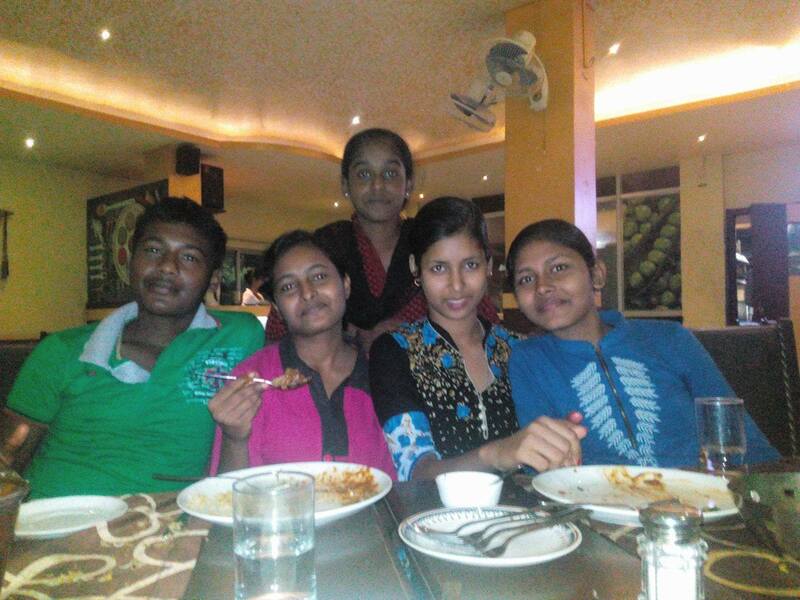 Over the last few months I got very close to a group of students (I had taught them Physics & Mathematics in their IX-X) and so I took them for a dinner treat in a restaurant in Kalyani when my first research paper got published. I request all the readers of this blog to help EK PEHAL team with their time (volunteer for EK PEHAL if you are a student at IISER Kolkata) or donate books and resources and even feel free to give suggestions. You may know more about EK PEHAL at https://sites.google.com/site/ekpehal2015/ or facebook page. Ministry of Human Resource Development (MHRD), Government of India established Indian Institute of Science Education and Research (IISER) in Kolkata and Pune in the year 2006 to promote the quality Basic Science by integrating teaching with state of art research facility. MHRD has established five more IISERs as of now located at Mohali(2007), Bhopal & Thiruvananthapuram (2008), Tirupati(2015) and Berhampur (2016). In very short time, IISERs have made the significant impact within India and abroad as well. Graduating students both BS-MS and Ph.D. are getting Ph.D./Post-Doctroal opportunities in best institutions of the world. In recently announced NIRF(National Institutional ranking Framework) 2017 by MHRD, four IISERs (Pune-29, Kolkata-44, Mohali-52, Bhopal-98) have secured the place in top 100 Institutes of India in overall category(considering all branches of study in India). Two meetings 1)IISER Standing Committee on 23rd June 2016 chaired by previous HRD Minister Smt. Smriti Irani, 2) NITSER Council meeting on 26th May 2017 chaired by current HRD Minister Shri Prakash Javadekar, have changed the whole perspective of Indian govt. towards IISERs which resulted in massive 150-275% fee hike for BS-MS to Ph.D. students. This illogical hike which can put a break on the progress of quality basic science and outreach of science as well, have brought huge disappointment in IISERs students. 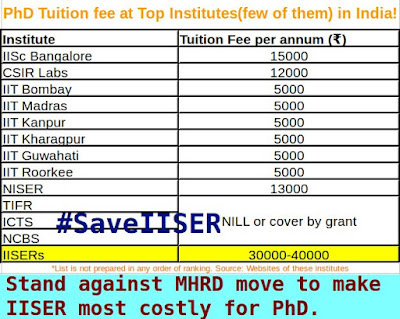 Image source: From twitter #SaveIISER expressed by IISER Students. 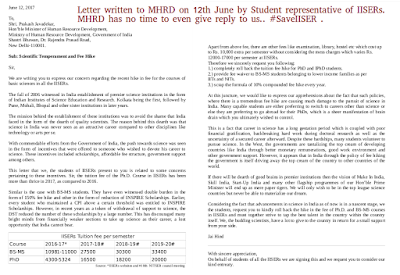 As per Students Affairs Council of IISER Kolkata, Students represntatives from various IISERs have written to MHRD to review this fee hike on 12th June 2017 but they are still waiting to get any response from MHRD. With this fee hike, IISERs have become the most costly institute for pursuing PhD in India in terms of tuition fee as per post of Students Affairs Council of IISER Kolkata . 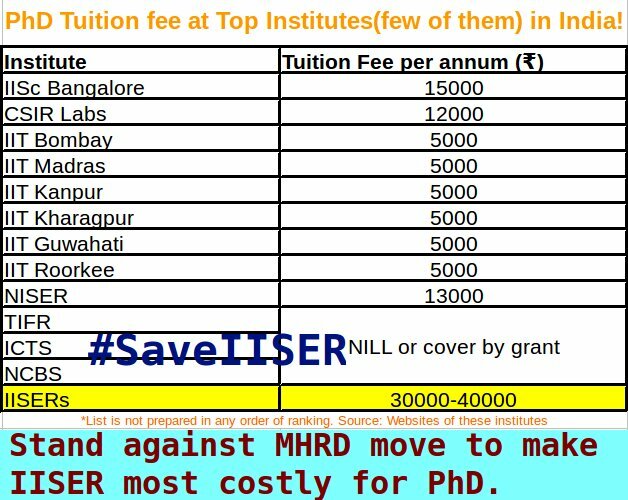 IISER which was established to promote research in Basic Sciences in India, has been made most costly Institute for Ph.D. by MHRD! Now one has to pay ₹30,000-₹40,000 as tuition fee per annum in addition of 25000-30000(except mess charges of 35,000-45,000) per year as fees for other facilities like library, hostel, exam etc to pursue Ph.D. at IISERs. It will not be wrong if one generalize that most of the students who pursue Ph.D. in India belong to middle or lower middle-class family. Even for many students, Ph.D. fellowship is the only source of income in their family. 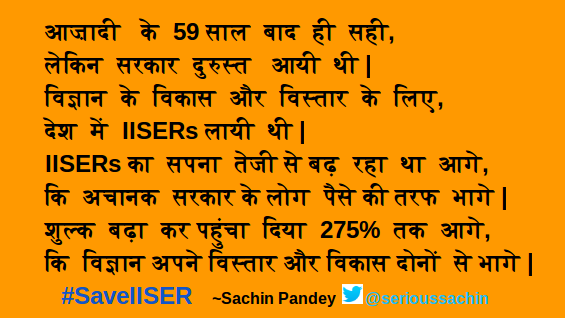 This fee hike of 200-275% for Ph.D. students has clearly closed the doors of IISERs for many talented students of India. "Outreach will remain out of reach until you genuinely want to do outreach!" 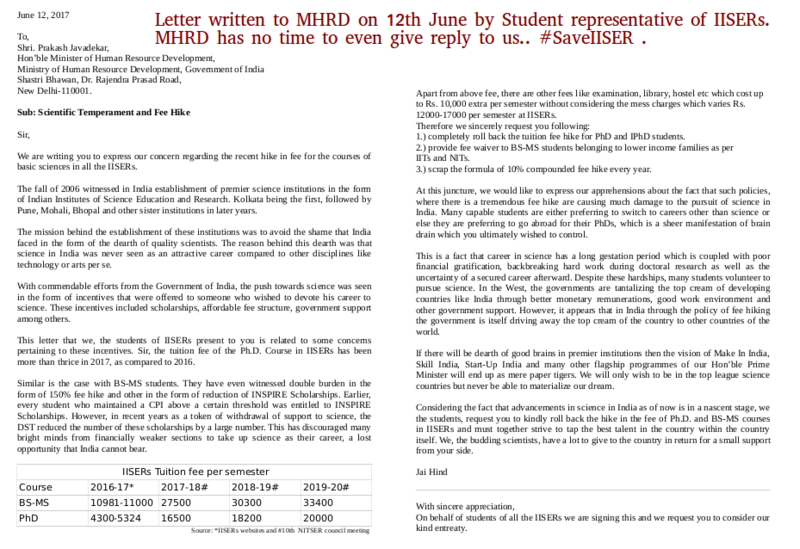 More unfortunate things, MHRD has not given any consideration to give any response/explanation behind such illogical and unscientific fee hike to IISERs community yet. It is well known that IISERs have already seen fund cuts by MHRD in last few years in addition to indirect fund cut by such massive fee hike. As per informal sources, MHRD has further threatened IISERs to cut more funds if they do not implement this hike. 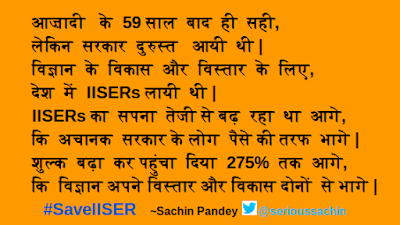 Therefore, IISERs are being treated as "Ignored Institute of Science Education and Research" by MHRD, Govt. of India.